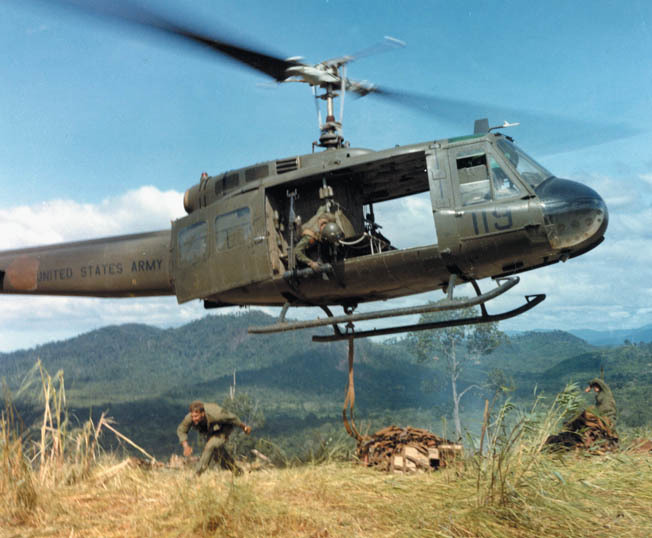 The UH-1 became an icon of the Vietnam War, ferrying troops to and from the Battlefield. As an icon of the Vietnam War and an angel of mercy for American troops who fought there, the Bell UH-1 Iroquois, affectionately known as the “Huey,” has gone on to become the most recognizable helicopter in the world. 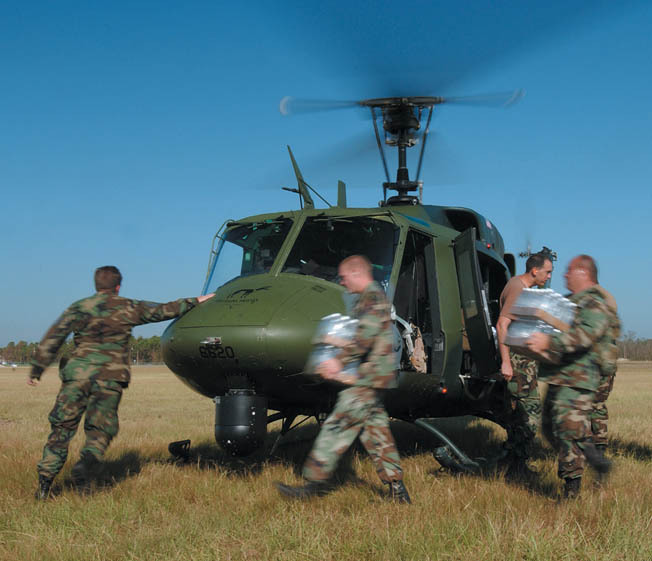 Fifty years after its birth, the Huey remains the only aircraft to be used by all branches of the United States military, including the Coast Guard. To American troops who were exposed to constant enemy fire, the Huey and those who flew them were angels from on high. To the Viet Cong and the North Vietnamese Army, they were angels of death. Pitted against an elusive enemy that utilized a complex network of underground tunnels to enable them to disappear into the jungle, American troops in Vietnam realized quickly that they would have to develop new tactics to gain the high ground, literally and figuratively. Gaining the high ground was exactly what the Huey was designed to do. Helicopters were initially used in the Korean War to rescue downed pilots and provide reconnaissance and medical evacuation. The concept of rotary-wing aircraft being used for air assault had yet to be envisioned. Shortly after Korea, the Army realized that it needed a multipurpose aircraft whose primary function would be to evacuate the wounded from the battlefield. The Army tasked the Air Force with developing the new concept. On February 23, 1955, Bell Helicopter Company won the contract to build the 204 Series HU-1, nicknamed the “Huey.” (The Department of Defense would later reverse the designation to the UH-1.) The Army initially ordered three prototypes. On October 22, 1956, the Huey made its maiden flight. A legend was born. The United States Marine Corps initially used the H-34 helicopter, nicknamed the “Ugly Angel.” After riding into battle aboard the rather awkward and bizarre-looking aircraft, Staff Sergeant Carl Christenson and 5,500 other Marines quickly found themselves fighting for life and limb in August 1965. Lt. Gen. Lewis Walt had launched an assault against the 1st Viet Cong Regiment; this was the first offensive military action conducted by a purely American military unit during the war. History would know it as Operation Starlite. “We landed right next to the VC command post and we nearly got wiped out,” Christenson recalled. “I remember the helicopters kept coming and coming and we had to get those guys out.” The Marines immediately learned that destroying the enemy stronghold at Van Tuong would not be an easy task. Their opponents comprised the 60th and 80th Viet Cong Battalions and the 52nd Viet Cong Company. Walt knew in the planning phase that to thwart and defeat the VC force, he would have to construct a definitive combined-arms force. Offshore were the USS Galveston and USS Cabildo to offer naval artillery support. The Marines from 3/3 conducted an amphibious landing. Under the command of Captain Paul Kelley, who would later become the commandant of the Marine Corps, Christenson and the rest of the 2/4 moved by airlift into a hot landing zone, where they met fierce opposition from the VC. The 2/4 were assisted by artillery fire support from a nearby artillery battery, the 3/12 Marines. Armed with the AK-47 assault rifle, a weapon superior to that of the M-14 rifle carried by the Marines, the Viet Cong unleashed a torrent of well-aimed fire. The 1st Viet Cong Regiment was outnumbered by the Marines nearly 3 to 1. However, the AK-47 served as an equalizer in the face of the much larger Marine force. The Marines of India Company 3/3 learned of this as they were pinned down by the VC at Hill 30, while waiting for reinforcements that never arrived. Firepower from the AK-47s also managed to neutralize five Landing Vehicle Tracks and three flame tanks. As a result, what began as an assault mission by the 3/3 soon became a rescue mission. In the process, the 3/3 lost their company commander, Captain Bruce Webb. By the time the 3/7 Marines arrived at the position to launch a counteroffensive, the enemy was gone. Operation Starlite was a bittersweet victory. Two Marines, Corporal Robert O’Malley and Lance Corporal Joe Paul, were awarded the Medal of Honor for their roles in the battle. A little over 600 Viet Cong were killed, while 45 Marines were killed in action. The battle taught the Marines several invaluable lessons about Vietnam: hydration was paramount in the intense heat, a more rapid-firing assault rifle was needed, and conventional vehicles such as personnel carriers, tanks, and other types of tracked vehicles were rendered useless in the thick jungle. Most of all, the Marines would need a rotary aircraft superior to the H-34. Why the Marine Corps was slow to incorporate the Huey is open to debate. Some argue that the Marines, due to interservice rivalry, may have been reluctant to accept an aircraft designed for the Army. Others say that since the Navy was slow to procure the UH-1 in sufficient numbers, the aircraft was slow to trickle down to the Marines. Regardless of the reason, the inability to get the UH-1 to the Marines in massive quantities would come back to haunt them seven months later in the A Shau Valley. Captain Norm Urban, a Marine H-34 pilot with the HMM-163 “Superchiefs,” heard distress signals coming from an Army Special Forces camp in the A Shau Valley on March 11, 1966. The camp was completely surrounded by Viet Cong forces and the entire North Vietnamese Army’s 235B Division. To further complicate matters, previous rescue attempts had failed as the enemy shot down a Marine A-4 Skyhawk, an Air Force AC-47, and an Army UH-1E. Upon hearing the calls for help, the pilots and crews of the Superchiefs sprang into action. A UH-D “Huey” helicopter airlifts empty water cans from American-held Hill 742 northwest of Dak To in November 1967. When the helicopters landed, they were immediately mobbed by panic-stricken soldiers of the Army of the Republic of Vietnam (ARVN), indigenous friendly personnel, and U.S. troops who rushed the aircraft. Because of the overwhelming weight loads, some of the H-34s were unable to take off. As Captain Urban would later relate, there were 20 soldiers in the helicopter’s cabin and three or four on the struts. He ordered his crew to throw some of the ARVN troops off in order to gain lift capability. While his crew struggled with the frantic passengers, the enemy began “walking in” mortar rounds. Urban narrowly escaped, and his aircraft was riddled by bullets. The next day, Urban was called in to rescue a downed Air Force pilot, Major “Buzz” Blaylock. Because of the H-34’s inability to land at the location, the pilot would have to be extracted by cable. To prevent weight overload, Urban had his crew throw all nonessential cargo overboard. Urban also had to burn up excess fuel and fly at high altitude, which caused extreme damage to the aircraft’s engine. Blaylock was safely extracted, but it had now become apparent that the H-34 was not up to the task. The Huey would become the premier helicopter of the Marine Corps. American strategists had long since concluded that the ground forces would need maximum firepower. With machine guns mounted on the aircraft, the Huey’s future role in the war broadened. By hovering over the enemy, the door gunner had the ability to see what the troops on the ground could not and could subsequently rain lead down on the enemy, thus tipping the scale in favor of the American forces. Having flown 73 missions as a door gunner in Vietnam, retired Lt. Col. A. Michael Leahy said that a Huey with an M-60 barrel protruding from the bay door was the last thing an enemy soldier wanted to see. For some, it was literally the last thing they saw. 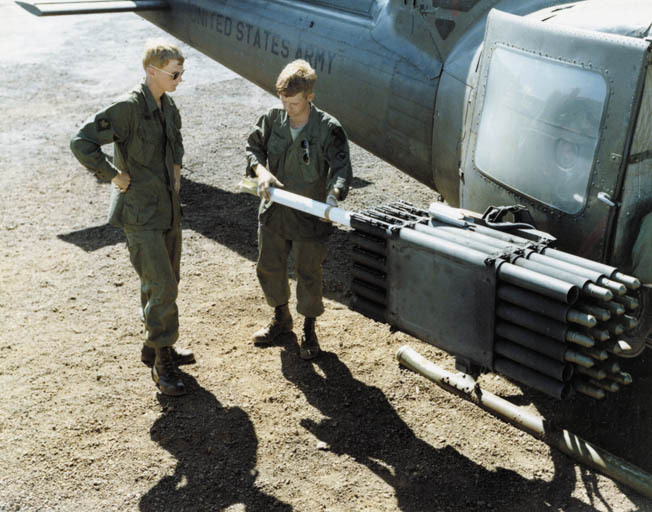 Crew Chief Eddie Townley of the 20th Artillery shows SP4 William Love the proper way to load and arm aerial rockets on a UH-1B in July 1967. Leahy would later become a Huey pilot with the VMO-1, flying extensive, dangerous missions in some of the most volatile areas of the war. During Operation Foster in 1967, he narrowly escaped death when his aircraft crashed after receiving intense gunfire. “Several bullets hit the aircraft and cut the hydraulic line and the rotor,” he recalled. “I could feel debris hitting my neck. If I had been standing, I wouldn’t be here today.” Now residing in Cary, North Carolina, the Philadelphia University of Art graduate operates his own studio and art gallery, where, through his artwork, the Huey is immortalized. His portrayals of the Huey in some of its most daring moments have won numerous awards and have appeared in several military publications. While serving in the Army as a part of a mechanized infantry unit, Private Nathaniel Walker was wounded when his armored personnel carrier hit a mine during a Viet Cong ambush. He was later evacuated on a Huey. “When you heard the rotors of the Huey coming you knew that you were alright,” he said. “To see it was a sigh of relief. Hell was over, you were going home.” Walker, who is now a sergeant first class in the Alabama Army National Guard with over 30 years of service, would receive the Purple Heart and Bronze Star for his actions. By war’s end, he would be one of the many thousands of American wounded who were extracted by the helicopter. Barbour recalls seeing Marines under intense fire charging the hill while carrying their wounded brothers to be evacuated. Maintaining discipline, Barbour never flinched as rounds pierced his helicopter. It was not until all the Marines were loaded that Barbour took off. Moments after liftoff, Barbour’s tail rotor was shot off—death seemed inevitable. “Luckily, because I had enough speed, I was able to keep it from spinning and kept it in the air for the next seven miles until I reached the hospital and got our boys to safety,” he recalled. Barbour’s heroic efforts and skill that day were captured in the painting, Emergency Medevac, by artist Leahy. Eventually, enemy forces learned effective means to shoot down the helicopters. During the height of the war, the enemy paid cash rewards to NVA and VC troops who shot them down and issued even greater bounties for capturing a live pilot who flew them. A total of 4,869 helicopters fell from the skies over Vietnam. The Huey UH-1 bore the brunt of these losses, some 2,591 in all. Since that time, the Huey has gone on to become a symbol of the American fighting spirit and technological development. The UH-1 gave birth to the AH-1 Cobra, which in turn birthed the AH-64. The H-60 and CH-53 are also based on the UH-1 concept. The oldest rotary-wing aircraft still in use by the United States is currently in combat in Iraq and Afghanistan. Utilized by over 100 foreign militaries around the globe, it is also used by law enforcement, hospitals, media outlets, and civil search and rescue. From the skies of Vietnam to Grenada, Operation Desert Storm, Bosnia, and now the global war on terrorism, the Huey has been relied upon to protect the United States from enemies both foreign and domestic. When troops needed crucial supplies and ammunition during the Vietnam War, it was the Huey they saw. When Marines needed to be evacuated in the aftermath of the Beirut bombing in Lebanon, it was the Huey that transported them. When troops went into the Sunni Triangle in Iraq, the Huey was the last thing some insurgents saw. And when stranded residents of New Orleans needed rescuing after the wrath of Hurricane Katrina, it was the Huey that plucked them from their rooftops. Not bad for a 50-year-old. Tags Afghanistan, AH-1 Cobra, Ambulance, American, Army of the Republic of Vietnam (ARVN), artillery, battlefield, Bell UH-1, Bosnia, cavalry, CIA, Dak To, Desert Storm, Galveston, Huey helicopter, Hurricane, india, Iraq, Korea, Korean War, lance, Lebanon, machine gun, Marines, Mary, medal of honor, military, Mobile Army Surgical Hospital (MASH), modern war, Modern Warfare, Mortar, museum, national guard, navy, New Orleans, North Vietnam, Operation Desert Storm, Operation Iraqi Freedom, OSS, POW, special forces, Sunni, Tanks, the korean war, the united states military, Tory, Troy, United States, United States Army, United States Marine Corps, united states military, US Army, Viet Cong, Vietnam, Vietnam War, War in Afghanistan, War on Terror, WIN, wounded. Half this stuff regarding the H-34 is bull___! My rescue of Maj Blaylock USAF went off without a hitch once we burned off enough fuel to hover at that altitude. NOTHING was wrong with the engine during or after the mission. Marines, both air and grunts LOVED the H-34.